A home’s front door can accomplish a lot: creating a lasting first impression on guests, complimenting other features of your home and even saving you money on energy bills. If you have been looking at your entryway recently and thinking it’s time for something new, consider these front door upgrade ideas, brought to you by Acadia Residential. With a wide combination of materials and styles on the market, selecting a new door is not a decision you will want to rush. Standard entry doors are typically made of wood, metal or fiberglass, and are designed as either a common panel door, windowed door or decorative door that features both panels and windows. Wooden entry doors are a popular choice, mostly because they can be custom-cut to your unique needs. Manufacturers can easily manipulate wooden doors to add decorative glass, sidelights or other stunning features. Wooden doors can, however, warp naturally over time due to the elements of the outdoors, so if you live in an area with high humidity, dramatic temperature fluctuations or near the ocean, you may wish to consider a different material for your front entryway. If you want the look of wood, but with a bit more durability, consider a fiberglass entry door. These doors can be stained in a variety of colors to give you the same beautiful look of traditional wood, without the potential for natural damage. Metal doors, with the most common types including steel and iron, can also feature a wide range of design and window options. Usually, these doors are the safest and most reliable when it comes to insulation because of how strong the material is. If you have older doors in your home, replacing them is a great way to lower your home’s heating and cooling costs. When selecting a door for energy efficiency, it is important to first consider their energy performance ratings in relation to the local climate and your home’s design. For example, if the front of your home receives a lot of sunlight throughout the day, you may want a front door that is designed to let natural warmth into your home during colder, winter months. To maximize energy efficiency in your home, look for a door with the ENERGY STAT-certified label, indicating that the door type has been tested for optimal potential of heat gain and loss, as well as the transmitting of sunlight into your home. Most entry doors are optimized to be energy efficient—due to the recent upgrades in industry standards—so finding a new door that will drive down energy costs is relatively convenient. 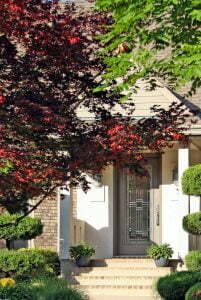 Every part of your home occasionally needs a new coat of paint, and your front door is no different. If you are ready for a new look, you’ll need approximately one quart of paint to get started. While you can choose any finish, glossy paints are typically preferred for doors and trims because they stand out and highlight architectural features. They also tend to stand up to nicks and scrapes better than flat or eggshell paint, meaning the paint job could last longer. Start by applying primer—if your door has not already been primed—and cover the door completely using a roller. When the primer is dry, use a paintbrush to go over any trim work or details on the door. Next, it is finally time to paint using a foam roller or a paintbrush. Note that a paintbrush will give you a nice, hand-painted look. Even if you use a roller, you can use a brush for the final coat to achieve this look. Allow the door to dry completely before reattaching the hardware and rehanging the door, if you have removed it to paint. If your entry door is in good condition, adding a storm door can be a great investment to help with energy costs, especially if you live in a particularly hot or cold climate. Storm door frames are usually made of aluminum, steel, fiberglass or wood, and use low-emissivity (low-e) glass or glazing. There are a variety of options for storm doors, but the majority consist of one piece of either single- or double-pane glass that increases the insulation to your entryway. 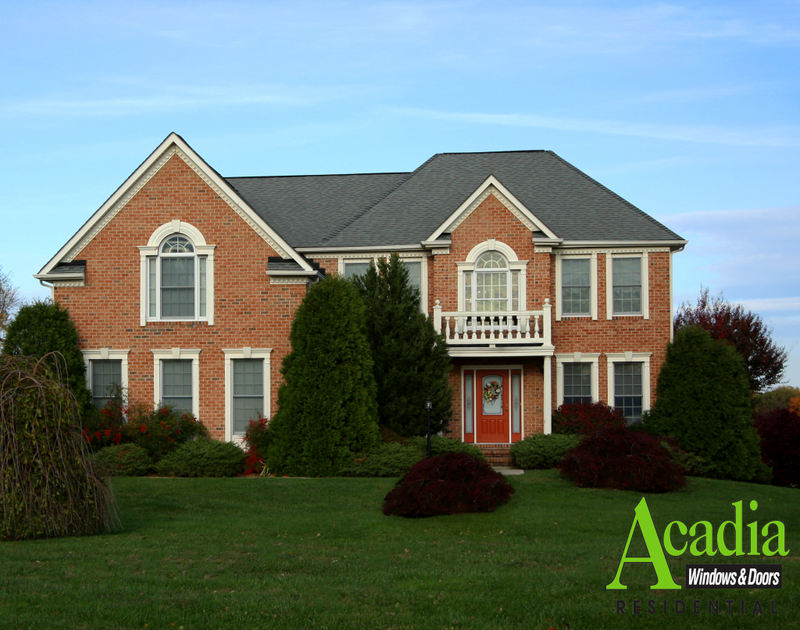 Acadia Residential is committed to fitting you and your home with an entry door that not only looks great, but also helps save you money on energy bills. If you are ready for a front door upgrade, or have questions about how a new door can be right for your home, contact Acadia Residential today!